Rotting of eggplant fruits in your garden is a sad sight to see. You nurtured your plants all spring and summer, and now they’re infected and unusable. Colletotrichum fruit rot is a fungal infection that can cause serious losses in eggplant harvests. This fungal infection is caused by a species called Colletotrichum melongenae. 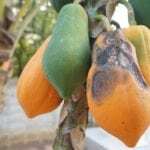 The disease is also known as anthracnose fruit rot, and it is prevalent in temperate and sub-tropical climates. 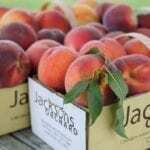 The infection usually strikes in fruits that are overly ripe or that are weakened in some other way. Warm and humid conditions especially favor the infection and its spread. So what do eggplants with Colletotrichum rot look like? Fruit rot in eggplants begins with small lesions on the fruits. Over time, they grow and merge into each other to create larger lesions. They look like sunken spots on the fruit, and in the center you will see a flesh-colored area that is full of fungal spores. This area has been described as fungal “ooze.” If the infection becomes severe, the fruit will drop. This type of fruit rot is not likely to occur, or at least not severely, if you give your plants the right conditions. For instance, avoid overhead watering like with a sprinkler when the fruit is ripening. The sitting moisture can cause an infection to set in. Also, avoid letting fruit ripen too much before harvesting it. The infection is more likely to take root in over-ripe fruits. This then makes other fruits susceptible. At the end of the growing season, pull out any infected plants and destroy them. Don’t add them to your compost or you risk allowing the fungus to overwinter and infect plants next year. You can also use fungicides to manage this infection. 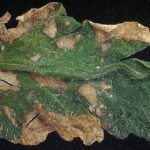 With eggplant fruit rot, fungicides are typically applied preventatively when the climate conditions are right for an infection or if you know that your garden may be contaminated by the fungus.